On campus apartments will be provided for all Fellow/ Postdoc/ Predoc attendees. Room reservations have been made on behalf of the attendees. Each attendee will have his or her own room. Linens and bath towels will be provided. There is no TV in the apartment. There is a full kitchen, but utensils will not be provided. Marshall College Apartments, building G and J are the provided apartments. 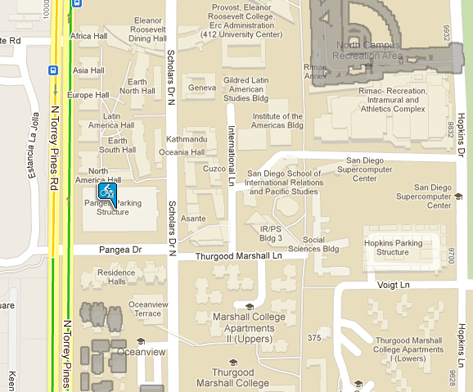 You can access an interactive map by searching for “Marshall College Apartment G” here: https://act.ucsd.edu/maps/. In the map below, buildings G and J are circled in red. 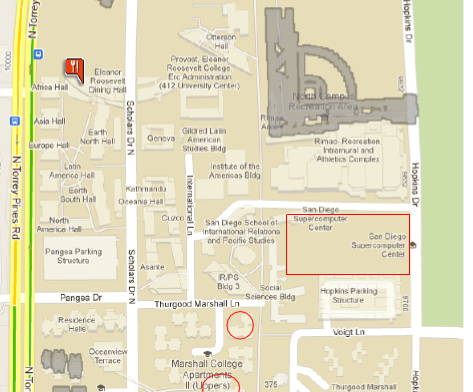 The meeting location SDSC is marked by a red rectangle. Check in will be from 8:00am to 2:00pm on Wednesday, 6/27/12. The location of the check in desk is a different location than the apartments attendees will be staying in. In the map above, the check in location is the purple symbol. Note: The ERC Conference Service Center will also be open 24 hours a day, if assistance is ever needed. All meals during the meeting, will be provided and served at the meeting. However, if attendees are checking out on Saturday, 6/30/12, the following meals will be provided at the on-campus cafeteria, Café Ventanas. Café Ventanas is marked by the red icon in the map below. If attendees have a car that needs to be parked on campus, please request a “Housed On-Campus” permit during the check in process. They will be available for all attendees staying on campus. These permits are ONLY available for yellow “S” spaces. 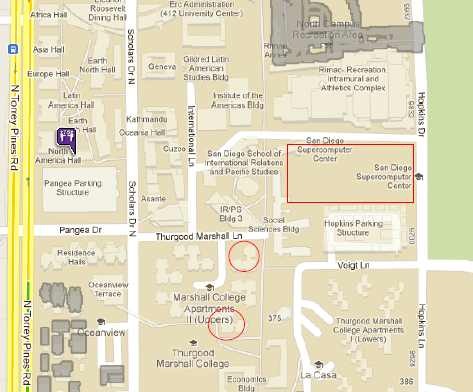 The closest parking structures available are the Pangea Parking Structure on the corner of Pangea Drive and Scholars Drive North. Each attendee is responsible for his or her own key(s) to the on campus apartment provided. If any key is lost, attendee will be billed directly for replacement charges. Keys and/or access cards are not returned at time of check-out will be considered lost and lock change procedures will begin immediately. Check out is at 11:00am on Saturday, 6/30/12. The location of the check in desk is a different location than the apartments attendees will be staying in. Senior members will be staying at the Estancia Hotel & Spa. Reservations will be made on behalf of the attendees. Check in is at 3:00pm on Wednesday, 6/27/12. Early check in has been requested for the group, and will likely be available. If early check in is not available, there will be luggage storage available at the hotel, and at SDSC (the meeting location). The meeting will begin promptly at 1:30pm. There will be a shuttle pick up at Estancia at 1:00pm. Check out is at noon. Any attendee wishing special consideration for late checkout should inquire at the front desk on the day of departure. If you are checking out on Friday, 6/29/12, please check out from the hotel before you depart for the meeting and bring your luggage to meeting. There will be luggage storage available at SDSC on 6/29/12. If you have an account on eduroam, select eduroam encrypted wireless, and use your eduroam credentials, including the @institution portion. The UCSD-GUEST wireless network is for all UCSD visitors and guests, and is an unencrypted service requiring daily user registration. Select UCSD-GUEST, open your web browser, then enter your email address. It may take up to three minutes to connect to the network. You will need to register for UCSD-GUEST in this manner daily. There will be shuttles provided from Estancia to and from the Meeting at SDSC. The shuttle schedule is as follows. The schedule is approximated and may change due to traffic, etc. Please note that if you are a local attendee with a car, you should drive to the Birch Aquarium. The Shuttle will transfer attendees from the Aquarium to the Estancia at the end of the evening reception, but will not go back to SDSC. More PDFs will be posted here when they become available. Speakers who will be presenting slides should bring their own laptop along with any necessary video adapter to provide a connection to a VGA (not DVI or HDMI) projector. If your laptop cannot provide a VGA output, either try to arrange to copy your presentation to a colleague’s computer, or contact us in advance so we provide details on how we can get your presentation loaded onto one of our laptops. The SDSC Auditorium projectors prefer the screen to be sized at 1024x768 @ 60 Hz. Most computers will automatically set this resolution when the projector cable is attached. If anyone requires anything greater than this, the projector will also accept a resolution of 1280x800 @ 60 Hz, but anything besides these two screen configurations will results in a poor-quality image on the screen. We will provide a laser pointer at the lectern. However, because we will be projecting onto multiple screens, for the benefit of the audience on the right, please try to remember to use your mouse pointer for pointing out items rather than the laser pointer, which would only benefit those sitting on the left. Also, if your presentation contains movies or sound files, please remember to connect the audio cable that will be available at the lectern. It will be piped through the auditorium’s sound system along with the lavalier microphone that we will attach to you while you set up at the lectern.